Cholinergic urticaria is a skin condition which features with the specific skin rash. The rash develops as a reaction to heat, emotional stress and it may also occur after exercise. Cholinergic urticaria affects both genders but it is more frequent in men. Skin rash is in a form of hives. Skin changes are approximately 2-5 mm in diameter. Skin rash in cholinergic utricaria is caused by massive release of histamine. Apart from being induced by heat, sweating and stress this skin condition may also occur due to certain medications, food, allergy to certain additives and after insect bite. Still, physical trauma is the most common cause of cholinergic urticaria. Pathophysiology of cholinergic urticaria has not been explained yet and this is why there is not known cure for this skin condition. The goal of the current treatment modalities is to reduce symptoms of the disease and bring them under control. If patients are familiar with what causes the attack they are supposed to avoid potential triggers. Appropriate clothes will reduce sweating and consequently prevent onset of the disease. Even dietary changes may be beneficial for patients suffering from cholinergic urticaria. Relaxation techniques, massage and meditation help in reduction of emotional and physical stress. Cooling sprays, ice packs and other cooling materials may quickly sooth the affected skin. If skin rash occurs due to certain medications patients are advised not to take them. And finally, exercise or sweat therapy includes regular exercise which induces repeated attacks which may result in limiting of the intensity of the attacks. 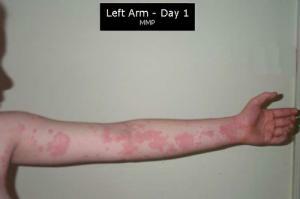 This method may be beneficial only in mild forms of cholinergic urticaria. In severe form of the disease regular exercise may only cause aggravation of symptoms. There are several groups of medications which are given to patients suffering from cholinergic urticaria. The first group includes antihistamines. These medications inhibit production and release of histamine and this way prevent the attack and further spread of the rash. Some patients are prescribed corticosteroids. Corticosteroids are usually given in severe form of cholinergic urticaria. Scopolamine butylbromide belongs to a group of anticholinergics and is occasionally given to patients. It is not effective in all patients. And finally, beta blockers may be effective in reduction of symptoms caused by this skin disease. Patients may additionally benefit from UVB light therapy. Anti-immunoglobulin E therapy with Omalizumab has been studied and the patients' response varies a lot. Doctors are also trying to administer certain neuropathic medications such as gabapentin and anti-depressants. And finally, antibiotics and antifungal medications are given if there is hidden bacterial or fungal infection while anti itch lotions and moisturizing creams may help with itching, cooling and softening of the affected skin.